Please click for details, including HOW TO FIND THE AUDITORIUM!!! A long time ago, in a sim space far far away, five boroughs competed . . . .
Save the Date- Chief Forum May 23! Send your newly minted chiefs for a full day of FREE leadership training! Network with over 50 EM chief residents from over 20 local programs. Click for details and RSVP! 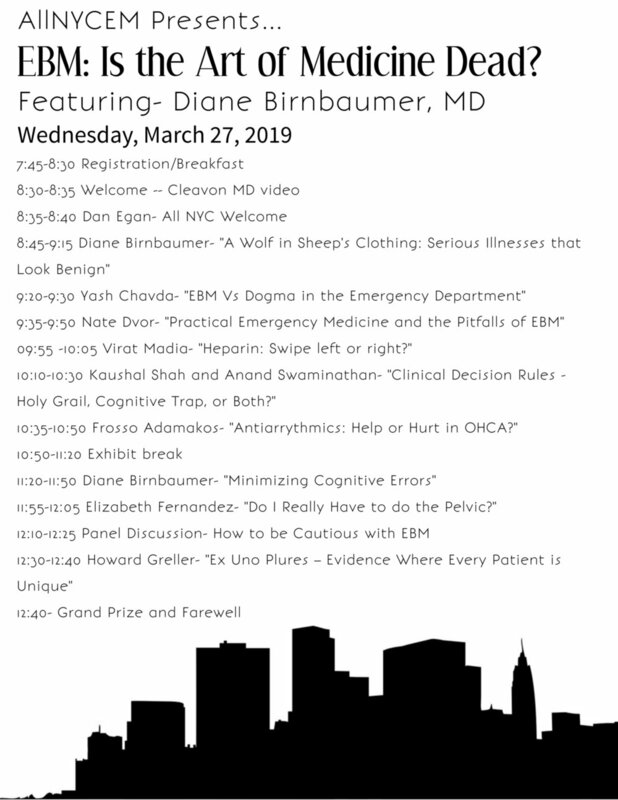 Registration for AllNYC EM #16 is open! We are very pleased to announce our 2019 AllNYCEM fellows! Introducing Dr. Suman Gupta from Maimonides, Dr. Mary McLean from St. John’s Riverside, and Dr. Kristen Ng from NYU. Our speakers were kind enough to each sum up their talks in a few short bullet points, please feel to download and save! Read on for details including the schedule for the conference. See you there! Please join AIRWAY and All NYC EM on Tuesday 10/30, the night before our Halloween conference, for a special event.